Now that we have discussed various block-allocation and directorymanagement options, we can further consider their effect on performance and efficient disk use. Disks tend to represent a major bottleneck in system performance, since they are the slowest main computer component. In this section, we discuss a variety of techniques used to improve the efficiency and performance of secondary storage. The efficient use of disk space depends heavily on the disk allocation and directory algorithms in use. For instance, UNIX inodes are preallocated on a volume. Even an "empty" disk has a percentage of its space lost to inodes. However, by preallocating the inodes and. spreading them across the volume, we improve the file system's performance. This improved performance results from the UNIX allocation and free-space algorithms, which try to keep a file's data blocks near that file's inode block to reduce seek time. As another example, let's reconsider the clustering scheme discussed in Section 11.4, which aids in file-seek and file-transfer performance at the cost of internal fragmentation. To reduce this fragmentation, BSD UNIX varies the cluster size as a file grows. Large clusters are used where they can be filled, and small clusters are used for small files and the last cluster of a file. This system is described in Appendix A. The types of data normally kept in a file's directory (or inode) entry also require consideration. Commonly, a 'last write date" is recorded to supply information to the user and, to determine whether the file needs to be backed up. Some systems also keep a "last access date," so that a user can determine when the file was last read. The result of keeping this information is that, whenever the file is read, a field in the directory structure must be written to. That means the block must be read into memory, a section changed, and the block written back out to disk, because operations on disks occur only in block (or cluster) chunks. So any time a file is opened for reading, its directory entry must be read and written as well. This requirement can be inefficient for frequently accessed files, so we must weigh its benefit against its performance cost when designing a file system. Generally, every data item associated with a file needs to be considered for its effect on efficiency and performance. As disk capacities increased, larger disks had to be split into 32-MB partitions, because the file system could not track blocks beyond 32 MB. As hard disks with capacities of over 100 MB became common, most disk controllers include local memory to form an on-board cache that is large enough to store entire tracks at a time. Once a seek is performed, the track is read into the disk cache starting at the sector under the disk head (reducing latency time). The disk controller then transfers any sector requests to the operating system. Once blocks make it from the disk controller into main memory, the operating system may cache the blocks there. Some systems maintain a separate section of main memory for a buffer cache, where blocks are kept under the assumption that they will be used again shortly. Other systems cache file data using a page cache. The page cache uses virtual memory techniques to cache file data as pages rather than as file-system-oriented blocks. Caching file data using virtual addresses is far more efficient than caching through physical disk blocks, as accesses interface with virtual memory rather than the file system. Several systems—including Solaris, Linux, and Windows NT, 2000, and XP—use page caching to cache both process pages and file data. This is known as unified virtual memory. Some versions of UNIX and Linux provide a unified buffer cache. To illustrate the benefits of the unified buffer cache, consider the two alternatives for opening and accessing a file. One approach is to use memory mapping (Section 9.7); the second is to use the standard system calls readO and write 0 . Without a unified buffer cache, we have a situation similar to Figure 11.11. Here, the read() and write () system calls go through the buffer cache. The memory-mapping call, however, requires using two caches—the page cache and the buffer cache. A memory mapping proceeds by reading in disk blocks from the file system and storing them in the buffer cache. Because the virtual memory system does not interface with the buffer cache, the contents of the file in the buffer cache must be copied into the page cache. This situation is known as double caching and requires caching file-system data twice. Not only does it waste memory but it also wastes significant CPU and I/O cycles due to the extra data movement within, system memory. In add ition, inconsistencies between the two caches can result in corrupt files. In contrast, when a unifiedthe disk data structures and algorithms in MS-DOS had to be modified to allow larger file systems. (Each FAT entry was expanded to 16 bits and later to 32 bits.) The initial file-system decisions were made for efficiency reasons; however, with the advent of MS-DOS version 4, millions of computer users were inconvenienced when they had to switch to the new, larger file system. Sun's ZFS file system uses 128-bit pointers, which theoretically should never need to be extended. (The minimum mass of a device capable of storing 2'2S bytes using atomic-level storage would be about 272 trillion kilograms.) As another example, consider the evolution of Sun's Solaris operating system. Originally, many data structures were of fixed length, allocated at system startup. These structures included the process table and the open-file table. When the process table became full, no more processes could be created. When the file table became full, no more files could be opened. The system would fail to provide services to users. Table sizes could be increased only by recompiling the kernel and rebooting the system. Since the release of Solaris 2, almost all kernel structures have been allocated dynamically, eliminating these artificial limits on system performance. Of course, the algorithms that manipulate these tables are more complicated, and the operating system is a little slower because it must dynamically allocate and deallocate table entries; but that price is the usual one for more general, functionality. Even after the basic file-system algorithms have been selected, we can still improve performance in several ways. As will be discussed in Chapter 13, most disk controllers include local memory to form an on-board cache that is large enough to store entire tracks at a time. Once a seek is performed, the track is read into the disk cache starting at the sector under the disk head (reducing latency time). The disk controller then transfers any sector requests to the operating system. Once blocks make it from the disk controller into main memory, the operating system may cache the blocks there. Some systems maintain a separate section of main memory for a buffer cache, where blocks are kept under the assumption that they will be used again shortly. Other systems cache file data using a page cache. The page cache uses virtual memory techniques to cache file data as pages rather than as file-system-oriented blocks. Caching file data using virtual addresses is far more efficient than caching through physical disk blocks, as accesses interface with virtual memory rather than the file system. Several systems—including Solaris, Linux, and Windows NT, 2000, and XP—use page caching to cache both process pages and file data. This is known as unified virtual memory. Some versions of UNIX and Linux provide a unified buffer cache. To illustrate the benefits of the unified buffer cache, consider the two alternatives for opening and accessing a file. One approach is to use memory mapping (Section 9.7); the second is to use the standard system calls readO and write 0 . Without a unified buffer cache, we have a situation similar to Figure 11.11. Here, the read() and write () system calls go through the buffer cache. The memory-mapping call, however, requires using two caches—the page cache and the buffer cache. A memory mapping proceeds by reading in disk blocks from the file system and storing them in the buffer cache. Because the virtual memory system does not interface with the buffer cache, the contents of the file in the buffer cache must be copied into the page cache. This situation is known as double caching and requires caching file-system data twice. Not only does it waste memory but it also wastes significant CPU and I/O cycles due to the extra data movement within, system memory. In add ition, inconsistencies between the two caches can result in corrupt files. In contrast, when a unified buffer cache is provided, both memory mapping and the read () and write () system calls use the same page cache. This has the benefit of avoiding double caching, and it allows the virtual memory system to manage file-system data. 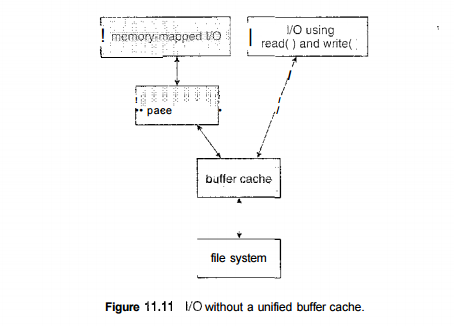 The unified buffer cache is shown in Figure 11.12. Regardless of whether we are caching disk blocks or pages (or both), LEU (Section 9.4.4) seems a reasonable general-purpose algorithm for block or page replacement. However, the evolution of the Solaris page-caching algorithms reveals the difficulty in choosing an algorithm. Solaris allows processes and the page cache to share unused inemory. Versions earlier than Solaris 2.5.1 made no distinction between allocating pages to a process and allocating them to the page cache. As a result, a system performing many I/O operations used most of the available memory for caching pages. Because of the high rates of I/O, the page scanner (Section 9.10.2) reclaimed pages from processes— rather than from the page cache—when free memory ran low. Solaris 2.6 and Solaris 7 optionally implemented priority paging, in which the page scanner gives priority to process pages over the page cache. Solaris 8 applied a fixed limit to process pages and the file-system page cache, preventing either from forcing the other out of memory. Solaris 9 and 10 again changed the algorithms to maximize memory use and minimize thrashing. This real-world example shows the complexities of performance optimizing and caching. There are other issvies that can affect the performance of I/O such as whether writes to the file system occur synchronously or asynchronously. Synchronous writes occur in the order in which the disk subsystem receives them, and the writes are not buffered. Thus, the calling routine must wait for the data to reach the disk drive before it can proceed. Asynchronous writes are done the majority of the time. In an asynchronous write, the data are stored in the cache, and control returns to the caller. Metadata writes, among others, can be synchronous. Operating systems frequently include a flag in the open system call to allow a process to request that writes be performed synchronously. For example, databases use this feature for atomic transactions, to assure that data reach stable storage in the required order. Some systems optimize their page cache by using different replacement algorithms, depending on the access type of the file. A file being read or written sequentially should not have its pages replaced in LRU order, because the most 11.7 Recovery 435 recently used page will be used last, or perhaps never again. Instead, sequential access can be optimized by techniques known as free-behind and read-ahead. Free-behind removes a page from the buffer as soon as the next page is requested. The previous pages are not likely to be used again and waste buffer space. With read-ahead, a requested page and several subsequent pages are read and cached. These pages are likely to be requested after the current page is processed. Retrieving these data from the disk in one transfer and caching them saves a considerable amount of time. One might think a track cache on the controller eliminates the need for read-ahead on a multiprogrammed system. However, because of the high latency and overhead involved in making many small transfers from the track cache to main memory, performing a read-ahead remains beneficial. The page cache, the file system, and the disk drivers have some interesting interactions. When data are written to a disk file, the pages are buffered in the cache, and the disk driver sorts its output queue according to disk address. These two actions allow the disk driver to minimize disk-head seeks and to write data at times optimized for disk rotation. Unless synchronous writes are required, a process writing to disk simply writes into the cache, and the system asynchronously writes the data to disk when convenient. The user process sees very fast writes. When data are read from a disk file, the block I/O system does some read-ahead; however, writes are much more nearly asynchronous than are reads. Thus, output to the disk through the file system is often faster than is input for large transfers, counter to intuition.